Most items on this page were originally published on the main page. I have listed dates originally published before each one. The WordPress 2014 annual review may be of interest to some viewers! I am cleaning up the site a bit, I have removed the Archives, as they weren’t viewed as much as I expected. I am leaving access to the 2014 events. If you would like to see any of the 2012 or 2013 published month events, please send me an email at bsheim@yahoo.com and put “HealthAware archives request” in the subject line. A new page has been added! For people who play the iPhone game Wallabee, go to the new page and comment for your copy of the HealthAware “unique”! A few days ago I had a teleconference with Paola Ardiles, founder of Bridge for Health bridgeforhealth.org. “Building a collective platform towards health and wellbeing for all.” We first met at the IUHPE conference in Thailand. We have decided to collaborate as we both are committed and passionate about health promotion. Check out her site, I think you will be impressed with her growing network and ideas! Over 20,000 views as of this month! Thank you everyone who has visited the site over the past 2 years! There are quite a few things planned for 2014. The site was updated, the large header removed and the logo placed on the right side of the homepage. Background colour was also lightened. A collaborative poster abstract has been accepted for the EAHIL conference in Rome later this year (more on that later). I’m looking at a potentially new user group, Wallabee fans, you know who you are! Additional countries with health awareness events have been added the past couple of months! 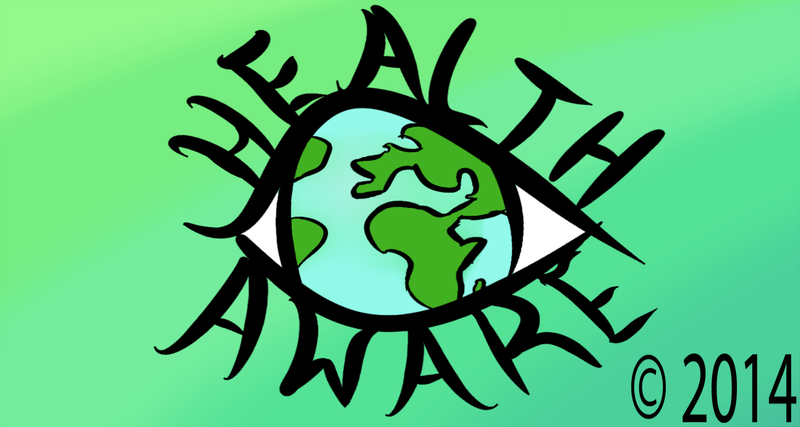 HealthAware now lists events for 25 countries and world wide events! These countries will no longer be listed at the beginning of each publication, they can be found on the right side of the page! Also, as the end of the year approaches, the 2012 events are being archived into one page. To view older events, click on the Archives 2012 tab. 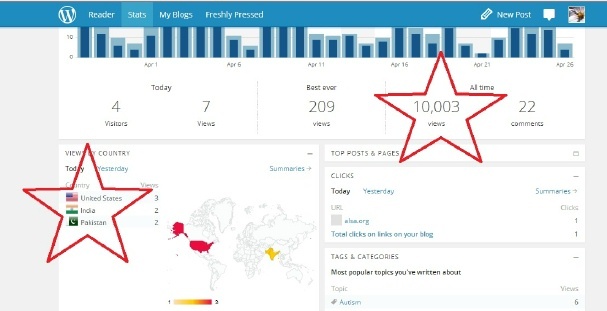 10,000 views! Thank you to the 10,000th viewer… someone in the US, India or Pakistan! My abstract, “HealthAware the first 12 months – what did and didn’t work for www.healthaware.org as a tool to global health promotion” was accepted for the 21st IUHPE World Conference on Health Promotion as a poster presentation! I will be going to Thailand for the conference in August! This isn’t my first conference to present information about the website, but it will be the biggest conference that I’ve presented at, and my first poster presentation. In March links were added for World Kidney Day in Chinese and in Turkish. Note the date for World Kidney Day in China was March 10th and the rest of the world marked this event on March 14th. A link was added to References to the Ministry of Health Portal for the Kingdom of Saudi Arabia. I have also found that there are over 45 different calendars in use around the world. I wonder how this affects health promotion where days/weeks/months are used for health promotion? In March I added the page “Plan Ahead For 2013” events are added as I find them. I am looking at ways to list health promotion campaigns around the world (by country), as I am finding many governments approach health promotion this way. Comments are welcome. January 19, 2013 – Finland and Russia! New for 2013 will be the addition of health awareness links to events in Finland and Russia. These will be added in their native languages. Many thanks to my overseas medical librarian colleagues, Tuulevi Ovaska and Guus Van Den Brekel. January 3, 2013 – A New Look for 2013! For the New Year, it seemed a good time to make changes to the website. Justin Heim created the new header, logo and icon for the site! I’m trialling using hyperlinks (like on the en Espanol page). Feedback is welcome! I’m also trialling hyperlinks (like on the en Espanol page). Feedback is welcome! 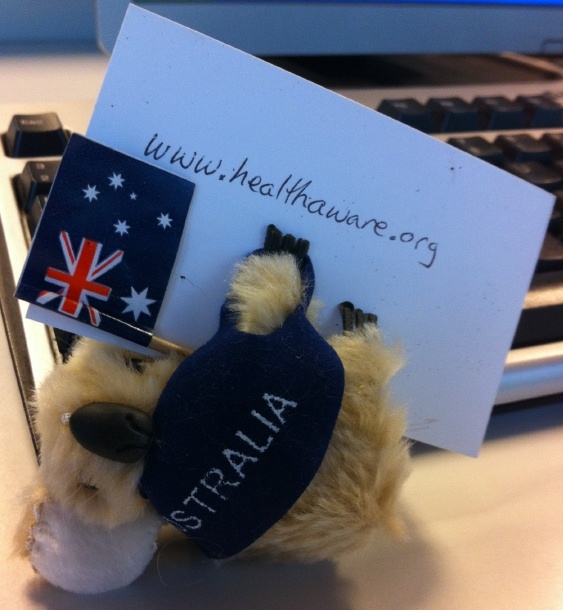 November 14, 2012 – HealthAware Thanks You! To go direct to the health awareness information for November, click here. A big THANK YOU to everyone who has visited the site this year! A special THANK YOU to the websites that have links to or mentioned HealthAware. http://www.netvibes.com/mundiales#Creditos my friends in Spain – a special thanks to Juan! http://www.phcris.org.au/publications/ebulletin/issue.php?promoid=515&stk=po&uid=100953&eid=12090&stype=ebltn&issue=30_August_2012&linkid=512899 under Resources, Thanks PHC RIS! http://newsletter.brightlabs.com.au/t/ViewEmail/r/F3975C7FCF25ED1F/DCD941CF5058865ECE63909E3969C05F Thanks CQ Medicare Local! http://www.gwahslibrariesblog.blogspot.com.au/ (see Sept. 13th entry) Thanks Don! There have also been links from the Queensland Health Healthy Lifestyles website (intranet only) and QUT (intranet only). As of November 14th, there have been over 6000 views from 82 different countries! Behind the scenes, a special thanks goes to Christine Jacobs who helps me find links to the events. If you’ve mentioned my site and I haven’t mentioned yours, please let me know! May 3, 2012 – News! April 30, 2012 – New Pages! March 2, 2012 – Pinterest? Yes! 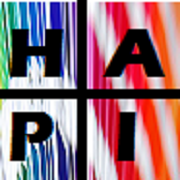 February 27, 2012 – HAPI now on Twitter! I’ve enjoyed putting together all the awareness events for others to use. It’s been an interesting project. There are a lot of health issues that need attention. The next step must be a global approach. I will be adding health awareness events from more countries. If you have access to health awareness events in other countries (besides Australia, Canada, UK, US) please consider contributing to this site. Also if you speak another language and would like to contribute, please let me know. This blog has been created to assist anyone who is interested in those special days/weeks/months of health awareness. I have searched worldwide to include relevant information for Australia, Canada, UK, USA and Worldwide events. Each month will consist of 2 publications, one for the monthly awareness and one for the days and weeks. There may occasionally be an additional publication. Please feel free to follow, repost or forward to friends and colleagues. If you know of others, please comment and include a link to further information. Hmm….outstanding blog post and posts listed here. are insightful!! 😉 Any sort of Feed on this web site? Tremendous things here. I’m very glad tto look your article. to touch you. Willl you please drop me a e-mail? Admiring the dedication you put into your website and in depth information you offer. It’s nice to come across a blog every once in a while that isn’t the same outdated rehashed material. Wonderful read! I’ve bookmarked your site and I’m including your RSS feeds to my Google account.